I’ve been behaving myself and working off those Christmas cookie pounds. I mean I really do want to loose some weight and keep eating healthier. But I feel like I’m ready for some balance in my diet (aka. bring back some desert please!). The Halloween to New Years period is a major yo-yo period for a lot people in the diet department. Way too much food, way too much candy and way too many baked goods from about Halloween to Christmas. After Christmas we start our diets or detox or whatever and get all that crazy excess sugar/fat out of our systems, but we often get a little zealous and cut out all sweets or carbs of all sorts… I hate to admit it but I tend to follow that pattern. I know that ideally I need to achieve balance. Mostly healthy foods, a little bit of a treat here and there, year round. But oh my its hard! Today’s recipe came about because I seriously needed to do some baking. This isn’t a super sweet over the top type desert, more of a breakfast bread, but it totally did the job for me. 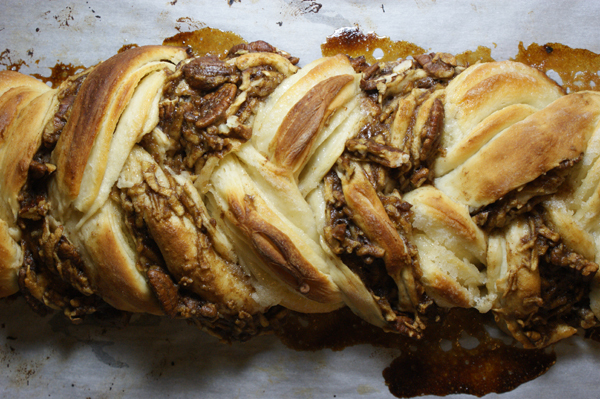 I have to admit this apple pecan (bread) braid is so tasty it’s going to be hard to do the balance thing and have a reasonable portion. This yeasty bread’s texture is a cross between a doughy cinnamon roll, and a fluffier airy bread. Amazing! (Picture a sing song voice when you read that.) The secret ingredient is potato flakes, I know weird, but don’t doubt me, it really makes for the perfect texture. Grated apple almost melts into the bread when cooked. And cinnamon with pecans tops it off. 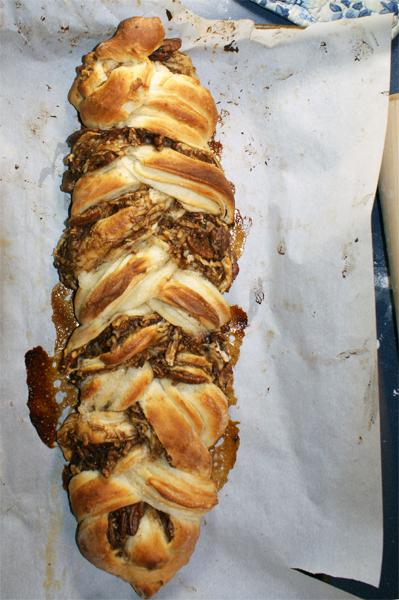 Plus the technique for putting the bread together creates a pretty fluttery effect through the braid. 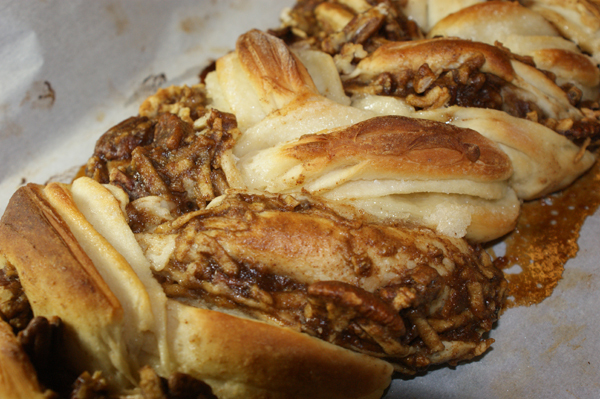 Pretty+tasty+sick of diet= make apple pecan braid now! 1. In the bowl of a large stand mixer, add flour and potato flakes. Mix to distribute potato flakes through the flour to prevent clumping when wet ingredients are added. Add sugar, yeast, salt, butter, vanilla, egg, and milk. Using the dough hook, mix until ingredients are well combined and form a crumbly dough. Allow the dough to rest for 30 minutes to better absorb liquid. 2. Knead the dough for ten minutes (by hand works best). The dough should become smoother and slightly sticky. If dough is too dry add a teaspoon of water at a time, kneading in between until the correct consistency/ stickiness is reached. Form a large ball with the dough. 3. Lightly oil a large bowl for the dough to rise in. Place the dough in the bowl and lightly oil the top of the ball to prevent dry out. Cover the bowl with plastic wrap and place in a warm place to rise. (70*-85* is ideal) The dough should rise for 2 hours and will double in size. 4. While the dough is rising mix the filling. In a medium sized bowl combine dry filling ingredients, sugar, flour, and cinnamon, and mix. Add apple, pecan, and vanilla and mix well until fully combined. Mixture will be wet looking. Set aside. 5. Mix the butter and sugar mixture. Melt butter and stir in sugar. Set aside. 2. Divide the ball into two portions, the first using about 2/3 of the dough and the second using about 1/3 of the dough. Roll the smaller portion into a 5 x 12 inch rectangle. Using a pastry brush, brush half the butter sugar mixture onto the rectangle. Starting with the long side of the rectangle roll the dough into a log sealing the edge. Set aside. 3. Roll the larger portion of dough into a 10 x 12 rectangle. Spread half the apple pecan filling on to the rolled out dough. Again starting with the longer side of the rectangle roll into a log and seal the edge. Using a very sharp knife cut the log in half lengthwise. Place the half pieces filling side up on the work surface. 4. Using the uncut log and two cut apart pieces, braid together. Keep the filling side of the cut pieces facing upward throughout the braid. Fold the ends together and seal. The final braid will have two "strands" with frilly pieces and filling showing and one solid "strand". 5. Place braid on an un-greased baking tray and cover lightly with plastic wrap. Place in a warm place for second rise. Allow the dough to rise for 2 hours. The braid will be small looking at first but will rise substantially during this step (double to triple). 6. Repeat the assemble process with the second ball of dough and remainder of fillings. 1. Preheat the oven to 350* and bake for 30-35 minutes until the braids are lightly browned. Check the loaves around 15 minutes and cover with foil if the edges are starting to over brown. If you want to make this bread over two days the dough can be refrigerated in it's rising bowl after step three has been completed, covered, overnight. When moving on to assembly steps the next day allow the dough to warm slightly before shaping.